Earlier this week, the Senate Homeland Security and Governmental Affairs Committee held a hearing on the Preventing Emerging Threats Act of 2018 (S. 2836), which would give the Department of Justice and the Department of Homeland Security sweeping new authority to counter malicious drones. Officials from both those agencies as well as the Federal Aviation Administration were present to discuss the government’s current response to drones, and how it would like to be able to respond. Interestingly, both the Senators and the witnesses seem to agree that there are some large, unresolved constitutional questions in this bill. In light of those questions, EFF strongly opposes this bill. Among other things, the bill would authorize DOJ and DHS to “track,” “disrupt,” “control,” “seize or otherwise confiscate,” or even “destroy” unmanned aircraft that pose a “threat” to certain facilities or areas in the U.S. The bill also authorizes the government to “intercept” or acquire communications around the drone for these purposes, which could be read to include capturing video footage sent from the drone. Most concerning, many of the bill’s key terms are undefined, but it is clear that it provides extremely broad authority, exempting officials from following procedures that ordinarily govern electronic surveillance and hacking, such as the Wiretap Act, Electronic Communications Privacy Act, and the Computer Fraud and Abuse Act. Given the breadth of these proposed new powers, you would expect officials to have a strong case for passing the bill. But even after the hearing, it’s not clear why DHS and DOJ need any expanded authority to go after “malicious” drones. For example, the FAA already has the ability to impose public flight restrictions for non-military aircraft, including drones. S. 2836 would expand those restrictions to any “covered facility or asset,” but does not narrowly define what is covered. Instead, the Secretary of Homeland Security or the Attorney General can make that determination, on their own, without public input and without public notice. While Committeeairman Ron Johnson claimed that the new authority would not give DHS the authority to “knock down drones flying around your backyard,” that’s not exactly true. The authorities in S. 2836 are explicitly written to support DHS missions, including those from U.S. Immigration and Customs Enforcement and U.S. Customs and Border Protection. If your backyard is on the border in San Diego or El Paso, nothing in this bill prevents DHS from determining that your backyard is now a covered area, allowing federal law enforcement to intercept or destroy a drone overhead. EFF has been concerned about government-owned drones operating along the border, capturing images of innocent bystanders on their own property. If this bill passes, DHS could access those same images, revealing those bystanders’ private activities and lives. Even if the need were clear, the new authority would need to be specific and narrow to guard against misuse. But in fact many of the actions authorized by the bill are vague and even contradictory. On one hand, officials are authorized to “disrupt” threatening drones by “intercepting… communications used to control the unmanned aircraft” and are specifically exempted from following the Wiretap Act, which puts in place stringent requirements to go to court for a “super warrant” before intercepting communications. On the other, the bill directs the agencies to develop procedures to ensure that interceptions are conducted “consistent with the Fourth amendment . . . and applicable provisions of Federal law.” The problem is the most “applicable” federal law is the Wiretap Act, which is often said to embody the requirements of the Fourth Amendment as well. Wiretaps are among the most sensitive form of surveillance, and the bill seems to allow the government to dispense with these protections merely on the say so of DOJ and DHS officials. Similarly, the bill does not define “threat,” except to say the Attorney General and DHS Secretary determine what actions are necessary to mitigate threats. Hayley Chang, Deputy General Counsel of DHS, suggested that it was not necessary to define “threat” in this bill, because “we don’t want to be back here in six months asking for new authorities.” However, if Congress does not define what threats DHS is allowed to target, this authority could be used to prevent journalists and private citizens from capturing footage of government activities or other legitimate news events. Additionally, S. 2836 would allow states to request federal law enforcement support at “mass gatherings,” which could include protests or other First Amendment-protected activities. It is easy to imagine a scenario where drone footage of protesters clashing with police could be perceived as a threat and destroyed before the public views it, especially because the bill explicitly allows the agencies to “intercept, acquire or access communications” without a warrant and without any court oversight, even after the fact. 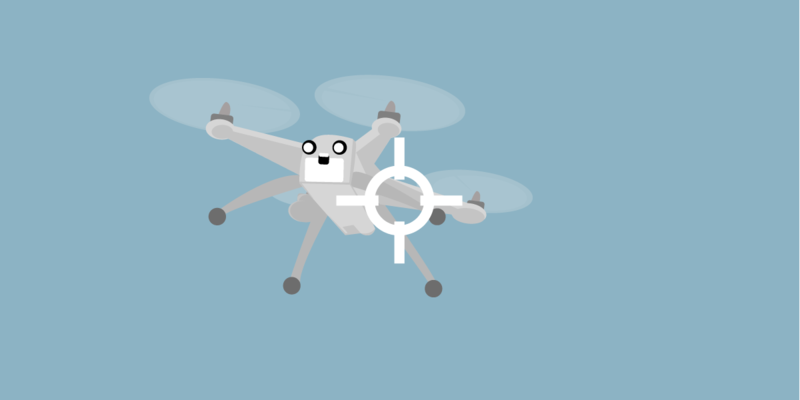 The seizure and destruction of drones also raises due process and additional Fourth Amendment questions, none of which are adequately cabined by the bill’s language. Again, even though DHS and DOJ say that they do not intend to use all of the broadly constructed powers in this bill, there is nothing to prevent them from doing so. To be clear, the government may have legitimate reasons for engaging drones that pose an actual, imminent, and narrowly defined “threat.” And the Department of Defense already has the authority to take down drones, but only in much more narrowly circumscribed areas directly related to enumerated defense missions. EFF is aware of the threat that drones can pose to public safety and privacy—we have been concerned about government drones for a long time. While we definitely see a need for protection, we don’t think the solution requires handing the government such unfettered authority to interfere with drones. S. 2836 is currently scheduled for a markup in the Homeland Security & Governmental Affairs Committee on June 13. During the hearing, Ms. Chang acknowledged the concerns with giving the agencies the “broad, categorical” carve-out from Title 18, but still didn’t articulate why the agencies should be allowed to sidestep current law with broad, vague authorities. We don’t think they should, and we recommend that the Committee not pass this bill.